Red Creeping Thyme -Non-culinary ornamental. 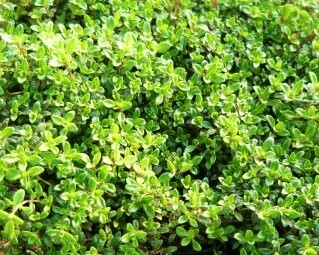 Low growing creeping variety will form a dense low mat and is perfect for use in rock gardens, around stepping stones, etc. Tiny dark green rounded leaves and dark rose colored flowers when in bloom. Most commonly grown as an ornamental. Perennial zones 4-8. Live starter plant in 3 inch container.